Built on the mission that food has the power to change our community, Nourish Yamhill Valley cultivates projects that build infrastructure and create a healthy, holistic, and equitable food system in Yamhill County. 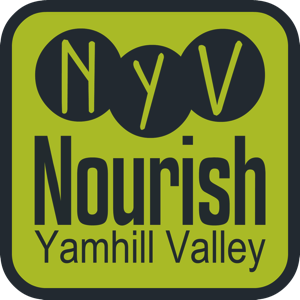 Our hope is that in 2020, Nourish Yamhill Valley is an established community collaborative committed to a holistic, equitable, and resilient food system. A resource guide to connect local consumers with local food. 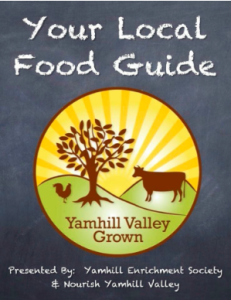 The guide features a full inventory of types of food, seasons of food, and local sources for food and is part of Yamhill Valley Grown. The main need requested out of the food summit of Yamhill Valley, the guide will grow as we do, serving to connect growers, sellers, and consumers all within our community. 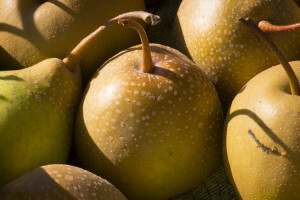 Launched to support and connect small-scale and beginning farmers throughout Yamhill County. 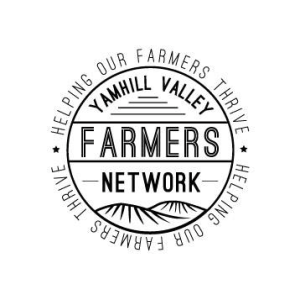 The farmer network mission is to help Yamhill Valley farmers thrive by providing access to information and education, and through fostering a strong and supportive local farmer community. Envisioned is a network of vibrant, sustainable, and successful farm businesses growing great food, stewarding our land, and connecting to our community to share their knowledge, passion, and products. With the goal of getting fresh local food in all Yamhill County schools, the council was established and charged with inventorying the schools, defining farm to school, and identifying channels for food to schools.